No continent is as diverse—or has as long of a human history—as Africa. 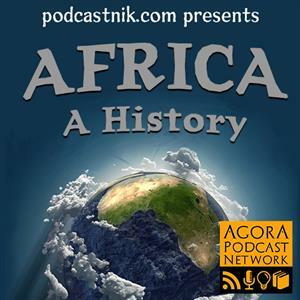 This podcast explores the rich cultures that have existed and can often still be found today. Part geography, part anthropology, and all of it history. A new episode exists on the new Podcastnik feed. This feed is being retired. For all content visit http://podcastnik.com YouTube channel: https://www.youtube.com/channel/UCXoGtTPofdH5m71SXlGKa2Q Visit http://podcastnikshop.com to support the show Twitter @podcastnik. . .
To fully cover the small island of Zanzibar a bit of everything is needed: the history of trade reaching from central Africa all the way to the Indian subcontinent. The unique history of Swahili and its role in the colonial policies. Dozens of goods, including slaves. Zanzibar was the capital of the Omani Empire for a time, and later was traded for Helgoland off the German coast.. . . The Rwandan genocide was one of the most brutal in human history. Also a lesson in international ineptitude. To make Africa a better place, check out this org: http://www.childsoldiers.org/. . .
A look at people who practically invented sustainability. The Pygmies living in the Congo have not had it easy.. . .
Our first look at a very ancient people living in southern central Africa.. . . This show will have a huge scope, this episode will define that some, and also give a glimpse at the person behind the mic. All other podcastnik shows can be found on http://podcastnik.com. . .